Water chestnut cake is a well-known Cantonese dim sum dish, almost served at every yum cha restaurant in Hong Kong. When Chinese New Year comes, Hong Kong people like to make their own different kind of cakes (糕), like radish cake (aka turnip cake), taro cake, sticky rice cake to celebrate the season. Needless to say, this water chestnut cake is one of Hong Kong people’s favourites. “Cake” (糕) pronounces as “high” in Cantonese, Chinese, that resembles a meaning of “rising”, ” growth”, “achieving higher level”, a symbol of prosperity and rising fortunes. The translucent appearance and tender texture of this water chestnut cake are remarkable, appealing to eyes and taste buds. This is the water chestnut flour that I used. Every time it won't let me down to create the texture I like. Water Chestnut powder that I used. 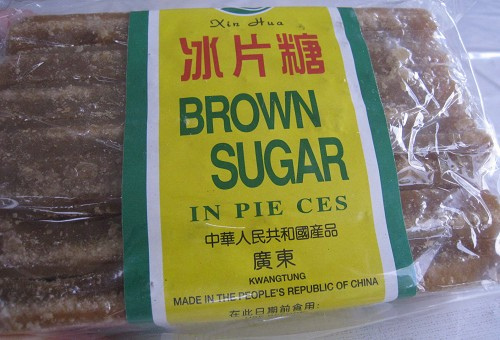 Brown sugar slab is often used to make Chinese dessert. It's made from unrefined cane sugar and gives you fabulous aroma and complex flavor. 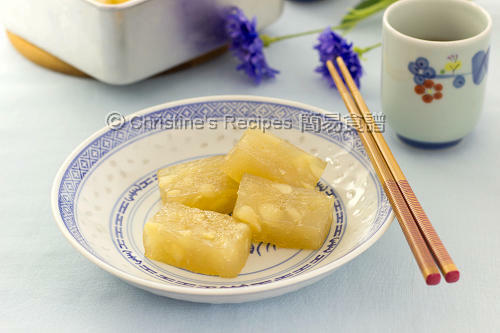 So I often use brown sugar slab instead of white or raw sugar when it comes to making this traditional Chinese snack. If you are lucky to get some fresh water chestnuts to make this cake, you'll find the crunch vegetable mingled inside will be an enjoyment. Grease the pan with a little of oil in order to help remove the cake from it at ease. 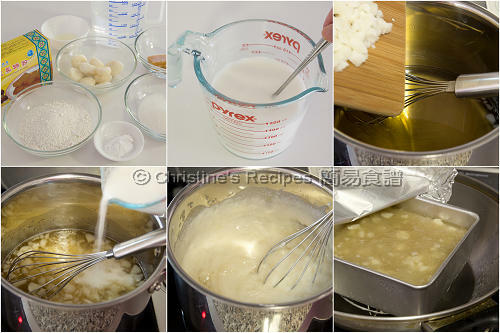 Dissolve the water chestnut flour with 300 ml of water and cornflour completely. Drain through a fine sieve. Stir in 2 teaspoons of oil. Set aside. Put the other 300 ml of water, together with white sugar, chopped brown sugar into a deep pot. Cook until the sugar dissolves completely. Bring it to boil. Add the water chestnuts. Reduce the heat to low. Stir in the dissolved water chestnut flour mixture. Immediately stir to combine well into a thick but smooth batter. Make sure not to let the batter stick to the bottom. Pour the batter into the greased pan. Use a teaspoon, wet with some water, to level the surface. Cover with foil and steam in a wok or steamer, for about 30 to 35 minutes, or until the cake turns translucent, or an inserted needle comes out clean. Remove from the wok and let cool a bit. Remove the cake from pan and slice into pieces. Serve warm immediately. Or pan fry slices before serving. The leftover can be kept in fridge, covered, for up to a week or so. The chilled water chestnut cake will turn a bit harder and opaque. When it’s reheated, it turns to be soft and translucent again. The cornflour can help produce better and firmer texture to hold it shape nicely. If you like the cake darker in colour, you can replace the white sugar with brown sugar slab. Or if you like your cake looks in a white colour, use all white sugar then. I followed my mother-in-law's advice and used the Pan Tang Guangzhou's water chestnut flour. She said it's the best to make this cake. This dish seems to elude me everytime I tried it. But thanks to your clear steps shown, I will try it again. Thanks for the recipe. Me too. It was so difficult for me to make. Good luck Elaine when you try again. I made this before but the chestnut powder tasted weird. So have given up hope to make it again But now that you've posted your recipe, will definitely try again. Thanks so much, I love this 'kao'! I went to the stores to look for the chestnut flour. I find at least a couple of manufacturers using the same Chinese Pan Tang name or Bantang on the package. I guess Pan Tang is a location and others claim to use the same method or style. Try to get the one that shown in the picture above. My mother-in-law said it's the best for making this dessert. 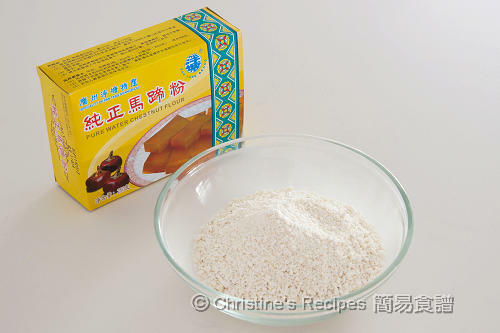 Christine, do you know if the water chestnut flour as shown above is available in Sydney? I saw it in a HK supermarket recently, but have not been able to find the same one in Sydney. I've tried many times to make this recipe but each time I make it, all the water chestnut pieces sink to the bottom and the whole thing becomes very firm, instead of the normal springy consistency. Any advice would be greatly appreciated! The brand I used shown on this post is very popular. I think you can get it from any Asian grocers in Sydney. Different brand of water chestnut powder is very different. Try mine, it won't let you down. Could you suggest a substitute of water chestnut flour? I don't have much confidence on imported products. Sorry, I'm afraid we can't find any other kinds of flour to substitute the water chestnut flour. 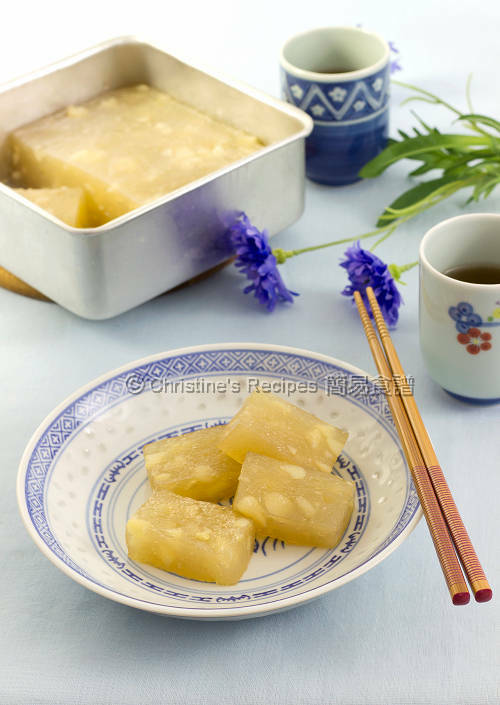 The water chestnut flour can produce translucent appearance with a bit of chewy texture. Quite unique. Did you use the brand I suggest? i tried this recipe but after steaming it, when i took it out from the pan the entire cake just went flop! it wouldn't hold its shape. i followed your recipe correctly. do i have to stir the mixture until it becomes very thick before pouring it into the pan to steam? It's quite unusual that the cake went flop. This cake won't rise at all when cooking. Suppose that the quantity of ingredients used and steps followed were right, the stove heat could be too high. Next time, reduce the heat a bit, and/or cover with a foil when steaming, and see if it'd be better. Thanks for the recipe Christine! I tried making this today with my mum and it turned out ok although the appearance/colour was more greyish and not as opaque as well as an uneven surface even after i tried smoothing it down with a wet spoon... yours look more appealing and the right colour! You could be right I did steam on high heat. I will try again tomorrow on low/medium heat. My batter was not as thick as yours and I did not need to smooth the top before I poured it into the pan to steam. Could that also be the reason why the cake would not hold its shape? Do I need to stir the batter on low heat until it becomes thick like custard texture before pouring into the pan? Did your batter look something like mine as the picture shown above (the last one at the right bottom)? The shape of the batter shouldn't be changed at all after steaming, just turns translucent. I'll love to try to make the water chestnut cake with your recipes but I have no idea where I can find the water chestnut flour as you stated in your recipe. I live in Los Angeles. Can you tell me where I can find this. Thanks! Do you have any Asian grocers nearby? They should have some because it's quite popular. Great ! Glad that your mum loved it. I will be sure to try out your receipe one day! but for now, I will be visiting HK soon, do you happen to know any stalls that sells awesome 馬蹄糕? I don't think there'll be any stalls in HK to sell 馬蹄糕 except in yumcha restaurants. Thanks Christine for the recipe. I tried it 2 days ago. Overall it was good, however I didn't get enough of the spongy feeling. Can you advise what is lacking? Corn starch, maybe? How spongy are you looking for? This steamed cake shouldn't be too spongy. I found the brand of chestnut powder shown on this post is the best. What brand did you use? More spongier, something like the restore of the Haribo lollies solid be ok. . It's kind of soft at the moment. Can't find the brand of the powder you're asking as the Chinese grocery stores here seems to carry only one brand. With the experience of my mother-in-law and trial-and-errors, the brand I used (shown in the picture on this post) is the best. It produces the texture we like. Others are either too soft or too hard. If you're using other brand, you might need to experiment with adding some corn starch. But you can't add too much of it as corn starch doesn't produce translucent effect. This cake is often served warm, leaving a few minutes after pan frying. The chilled cake will turn hard and opaque. I love chestnut cakes! May I know if I can substitute the brown sugar slabs with brown sugar instead? You can. But the end result will be a bit different, including the colour and the sweetness. Hi Christine, this recipe did not turn out well for me. I kept steaming (medium heat, with steam coming out of cover) but the batter would not set. It remained sticky and soft and never firmed up. I used the water chestnut powder brand that you recommend and i followed the 300ml + 300ml water per the recipe. Do you have any idea where i went wrong? Also, when i strained the water chestnut powder/water mixture, i saw a alot of flour clumps. i kept stirring but it wouldn't dissolve so i pushed it thru the strainer and poured everything into the simmering sugar mixture. any idea where i went wrong? i would like to try again...and p.s. i am using fresh water chestnut. thank you. I've used this recipe for many times. And it's worked every time. You're right. It's quite difficult to get waterchestnut powder dissolved. You may press it with a teaspoon and it will help a lot. If not enough waterchestnut powder dissolved, your batter won't set properly. Besides, if any water condensed and dripped on your batter while steaming, your cake will turn too moist and too soft. This recipe did not work for me. I used the flour as recommended and also ensured cake was covered while steaming. It turned out gloppy and could not hold it's shape while being cut. It was also not translucent and springy. Not sure what's your problem as I didn't watch you cooking in your kitchen. Sounds like the water chestnut flour was not added enough, or it wasn't dissolved completely. It's quite challenging to dissolve water chestnut flour. You have to press it and mix it very well. If it's not dissolved completely, the cake can't hold its shape at all. About how many brown sugar slab is 50gram brown sugar slab? Thanks for commenting. It’s fixed already. Can I use an Instant Pot to do this? sure you can use IP to make this cake. But you need to adjust the cooking time with IP. Hi Christine, when I used hot water to dissolve the water chestnut flour (I did use the brand you recommended), it turns into this goop that's impossible to mix later into the sugar mixture. Do you have any advice on how to avoid this? Thank you! Are you talking about the step in method 2? I only used water at room temperature to dissolve the water chestnut flour. Yes, it takes some time but it will dissolve eventually. Just a bit of patience to mix the flour with the water. Using hot water is quite risky and it'll ruin the texture.